Is your water running slowly? Maybe your toilet often struggles to flush, or it overflows every time you run your washing machine. All of these can be signs that your sewer drain needs cleaning. This can sound like a daunting task, but that’s when you call us. At Lightfoot, we’re experienced in all sorts of drain cleaning. We’ll get your Granbury, TX house running like it should, so you don’t have to worry anymore. Just give us a call. Our operators will answer any questions you might have about working with us, then they’ll schedule a convenient time for a plumber in Granbury TX to come out. Our plumbers arrive on time, ready to work. They’ll listen to you describe the issue, test things for themselves, and make an assessment about what needs to happen. Then, they’ll get everything fixed so you don’t have to worry about your home anymore. So, your sink runs slowly. Maybe you’ve cleaned it out as much as you’re comfortable with or poured a chemical solvent down it, only to find that it’s still backing up. That’s when you give us a call. Our plumbers come with drain cleaning equipment on every truck. This includes the plumber’s best friend, the plumbing snake. Our snakes aren’t like the ones you can rent at the hardware store, though. They are heavy duty, professional snakes, designed to clear out drains quickly, without getting stuck inside or causing other problems. No matter what it takes to clean out your small drain, our plumber are up to the task! Sometimes, a clogged drain indicates a larger problem. If we determine that your sewer drain needs cleaning out, we’ll get that job done, too. Here are a few things to look for when deciding whether the problem is with a small drain or a big one. Repeated clogs. When your sewer drain is clogged, drains will clog up all the time. In fact, you may feel like you spend all of your time on drain cleaning. Multiple clogs at once. If the sewer is clogged, then nothing can drain. This means that your kitchen, your bathroom, your dishwasher, your washing machine, and more can all back up at once. When this happens, the problem is often in the sewer. Unusual plumbing issues. When the sewer is clogged, large volumes of water can’t go down it. This means that when your bathtub drains or your washing machine finishes its cycle, that water has to go somewhere. 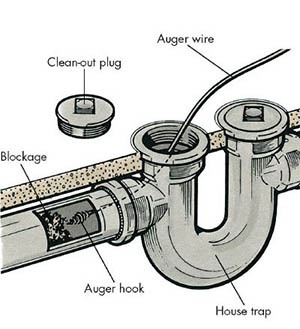 If it appears in your toilets, tubs, or sinks, you probably have a sewer clog. When you make a call to Lightfoot, you’re calling in some of the best plumbers Granbury has to offer. Our people have the ultimate skillset, which they’ve gained through rigorous training and hard work. Their experience has given them the ability to work on any plumbing problem, be it big or small. Whether you need your kitchen drain cleaned out or your sewer, we’ll get the job done quickly and with efficiency, so you can get back to your everyday life.